McCue offers a wide selection of material handling products that foster fork truck safety. According to the Occupational Safety & Health Administration (OSHA), adhere to the following guidelines to ensure safe fork truck operation. Avoid grease on your shoes and wear appropriate footwear for mounting and dismounting. When starting or stopping, use a spotter when necessary and watch for blind spots. Block wheels when parked on an incline. Avoid parking in unauthorized areas or obstructing aisles and exits. When operating at speed, slow down for wet floors and be attentive. Reduce your speed in turns. Use your rear-view mirror when applicable for steering, turning and changing directions. Do not grab the overhead in reverse, and never turn on a grade or with forks elevated. When parking, fully engage the parking break and neutralize the controls. Turn the key OFF and stop the engine before removing the key. Never jump off a forklift. For general safe operating practices, yield to other vehicles and do not cross railroad tracks. Never carry passengers, slow down on wet floors and keep your arms and legs inside the fork truck. If you do tip over, stay in the forklift. Hold onto the steering wheel and lean away from the impact—bracing your feet. Fork truck operators should be protected from every angle. We know that accidents happen. 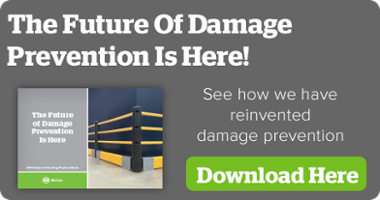 The safer your warehouse is, the easier it will be to operate efficiently. Here are just a few of McCue’s warehouse solutions that help protect your building, your equipment and your people. No other company protects warehouse columns like we do at McCue. Our Column Guard provides a shock-absorbing cushion to protect fork truck drivers and columns alike. Column Guards can fit any column size, so you don’t have to buy a bunch of different solutions. Getting in and out of doorways in your warehouse can be tricky. Easily load and unload pallets all day long without worry using our Goal Posts. Engineered to withstand heavy impact, these protective barriers spin and lift on impact, cover the entire door area and easily install in minutes. Fork trucks will hit the goal post before impacting the door frame, protecting the structural integrity of your warehouse. Our shock-absorbing Rack Guards are a proven way to protect your pallet rack columns from forklift and pallet jack damage. Zinc electroplated finishing means you never have to worry about rust or corrosion. Get a quote today and start building a better, safer warehouse for your fork trucks and employees!